Ever wondered why we are always going on and on about the importance of natural or green alternatives? Well, we thought it would be a good idea to start discussing the importance of introducing much gentler natural beauty products and household supplies into your homes. We will start by discussing some of the most popular cleaning and air freshening products that have been sold and advertised to us so rigorously over the years that they have become trusted household products in our homes. Unfortunately, some of these might actually contaminate the air we breathe and our bodies’ natural chemistry. This link from BBC news goes into some more detail about these potential health threats: http://www.bbc.co.uk/news/health-35629034. Aerosol sprays – These are full of synthetic fragrances that can often contain phthalates known to be hormone disrupters. Studies have also indicated that use of aerosol deodorants or fragrances could be linked to a damaged sperm count. 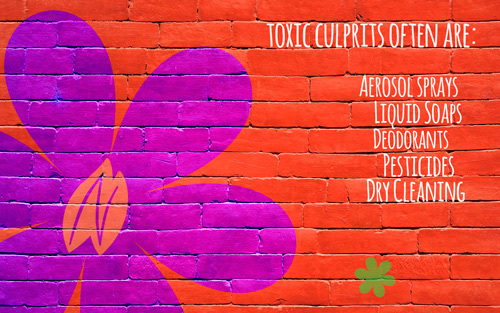 These sprays can also aggravate asthma, irritate sensitive skin and they can also have an effect on the eyes or throat. Liquid Soaps – Some liquid soaps that boast antibacterial properties often contain a synthetic chemical called triclosan that has been linked to hormone disruption. Some of the chemicals in these anti-bacterial soaps are essentially considered a form of antibiotic that cannot kill viruses, but only bacteria. The overuse of such chemicals has been linked to increased frequency of super bug outbreaks. Deodorants – A lot of antiperspirant deodorants contain aluminium to block the pores and prevent us from sweating, which is the body’s natural process of eliminating toxins. Studies have shown that high exposure to the type of aluminium found in deodorants can in fact act as a neurotoxin. Chemical-based pesticides – Pesticides that are used to kill anything from bugs, rodents, weeds and fungi are very often neurotoxic to ourselves and our pets too. They work to destroy the nervous system of organisms in order to eradicate them, which explains why they would also be harmful to humans and other animals. Dry Cleaning Chemicals – Dry cleaning uses chemicals like Perchloroethylene to get rid of dirt and oils on clothes. This is a toxic chemical that can often cause headaches, nausea, respiratory irritation and many other health issues. Now that we have had a little look at some of the potential toxic chemical threats that we often encounter on a day-to-day basis, it’s time to look into some healthier alternatives for you and your family. There are a whole host of ways to get around using some of the chemical products that we have become so familiar with.